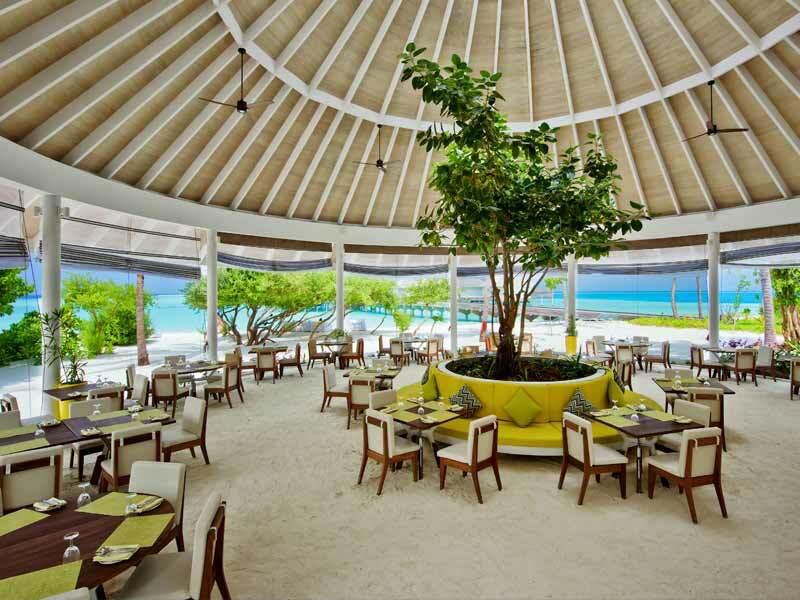 Situated on one of the largest and most beautiful islands in the Maldives is Kandima Maldives. 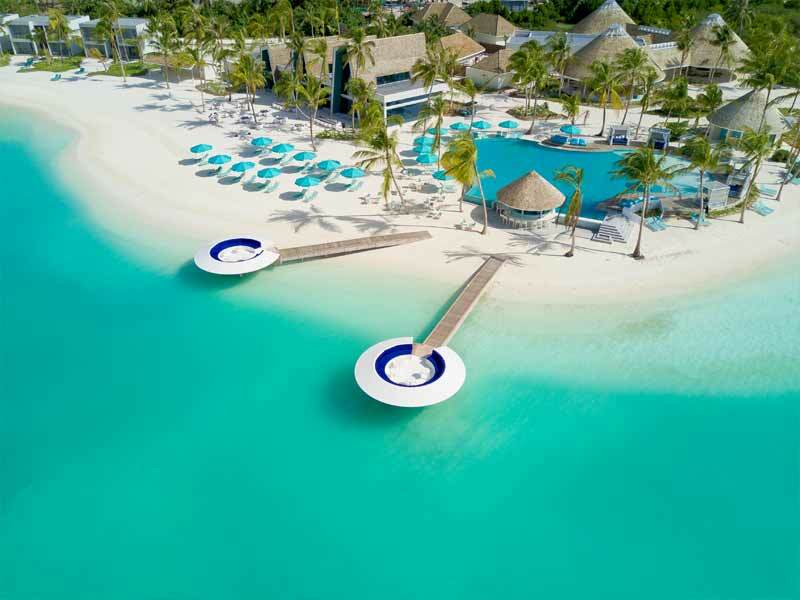 This stunning resort sits right on the breathtaking white sandy beach and is the perfect location to relax and enjoy an oceanfront getaway. The huge beach stretches for kilometres, giving you plenty of space to enjoy all the fun activities that are on offer here. When you are looking for somewhere to escape from the stress of the world and be surrounded by one of the most picturesque settings you could ask for, you won’t find a better option that Kandima Maldives. The resort sits right on the white sandy beach, just steps away from the peaceful blue ocean stretching beyond the horizon. 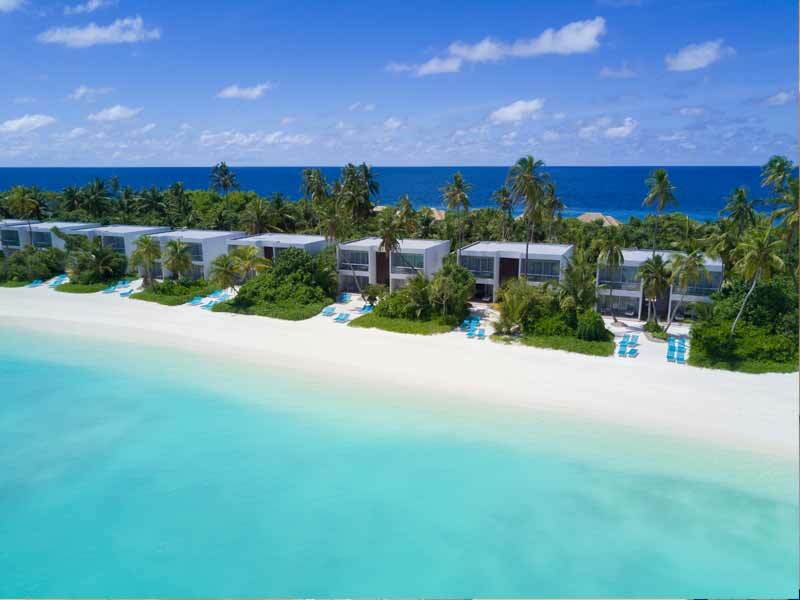 On offer are 266 studios and villas, ranging from the beachfront Beach & Sky studios through to the Aqua Villas situated completely over water, so there is something to suit every traveller. With 10 restaurants and bars to choose from, each having a different menu of local and international cuisines, you are guaranteed to find wonderful dining options during your stay. When you decide to indulge yourself, the Eskape Spa is the perfect choice, offering a range of massages and health treatments in tranquil treatment rooms sitting right on the beach. If you’re in the mood for a workout, the resort offers a 24/7 fitness centre with an extensive range of cardio equipment and weight machines. There are also personal trainers available to help with your fitness goals, or if you prefer, you can take part in one of the Pilates, Yoga or fitness classes offered. The Kandima Kids’ Club is a safe and amusing space for kids to spend time under the supervision of qualified child carers. Daily programs are run to keep kids busy and having fun. The resort has a well-equipped medical centre with a range of state-of-the-art equipment and fully qualified GP’s, nurses and a dentist, all to ensure that guests can have complete peace of mind during their stay. 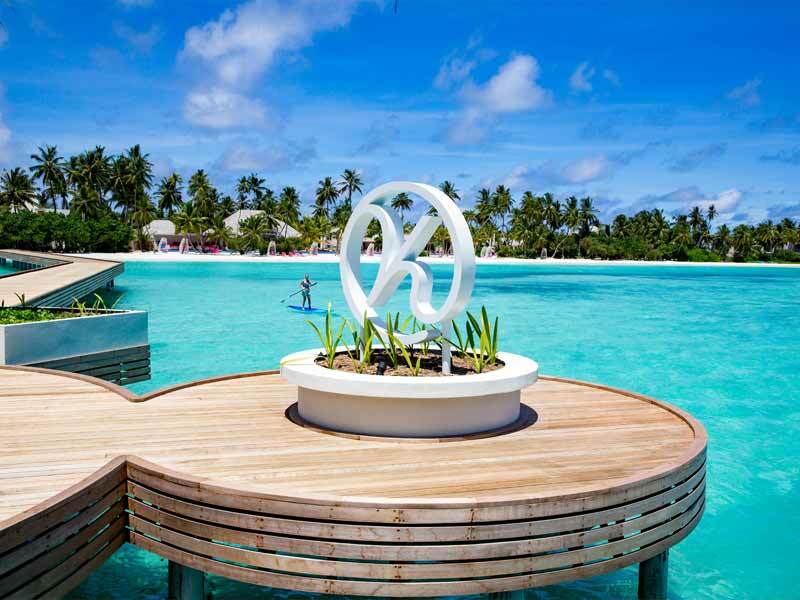 Why Go To Kandima Maldives? 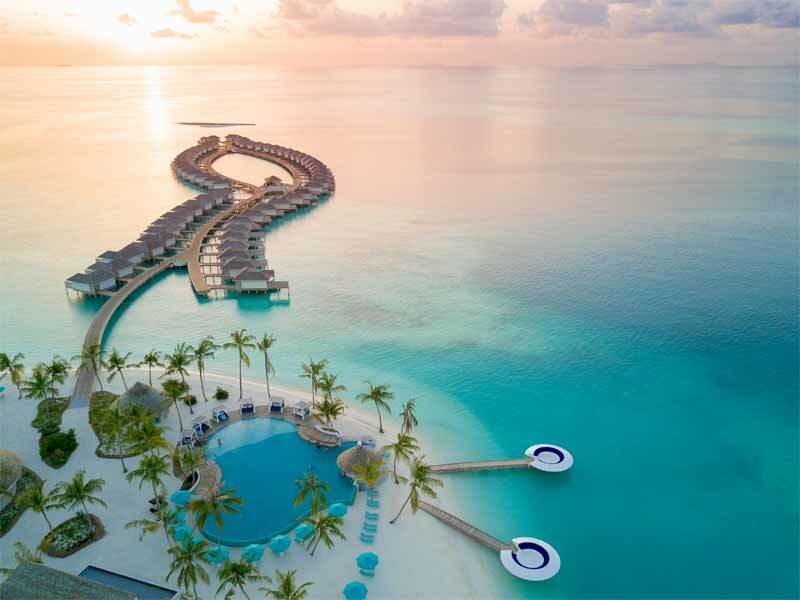 Nestled among a breathtaking setting of white sand and towering palm trees, Kandima Maldives is a perfect spot to get away and experience this magical part of the world. The resort offers an amazing range of fun and interesting activities to enjoy and plenty of dining options to try. Your studio is just steps away from the magnificent turquoise water and you will love your stay on this island paradise. The studio has been designed using chic and light-toned styling and the surrounding marine environment is subtly reflected in the colour palette of the trims and finishes. The huge sliding doors open wide to invite the natural light into your studio and leads you out to your private balcony that overlooks the stunning white sand and turquoise ocean only a few feet away. Your room is 40sq. metres in size internally with another 15sq. metres of outdoor terrace, giving it a spacious and open feel. Your studio is air-conditioned and has a King-size bed and large flat-screen TV with satellite TV channels. Who doesn’t love a beach retreat? 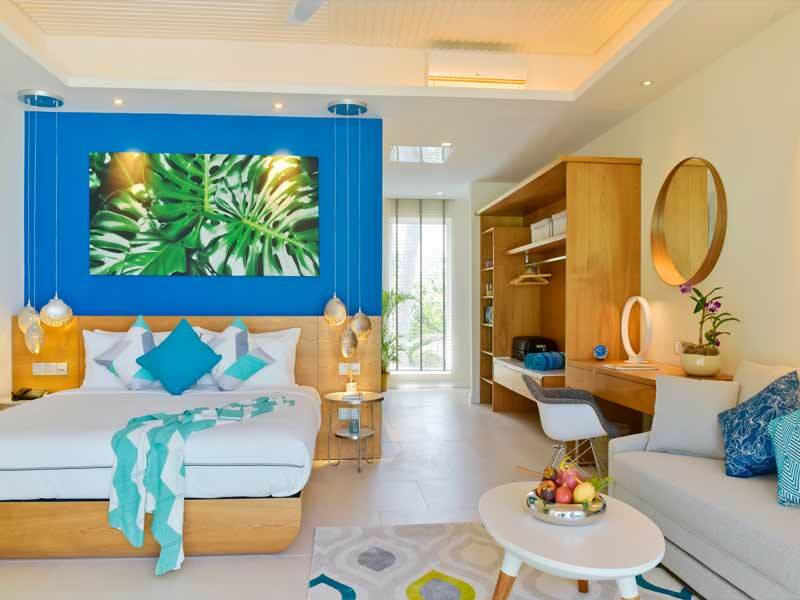 Positioned within a 2-storey villa on the shore’s edge, your Beach Studio boasts modern and vibrant décor designed for your comfort and convenience. Indulge in imposing views of vast aqua sheets from your private 15sq. metre terrace or enjoy air-conditioning, lavish King bedding and your flat-screen TV indoors. 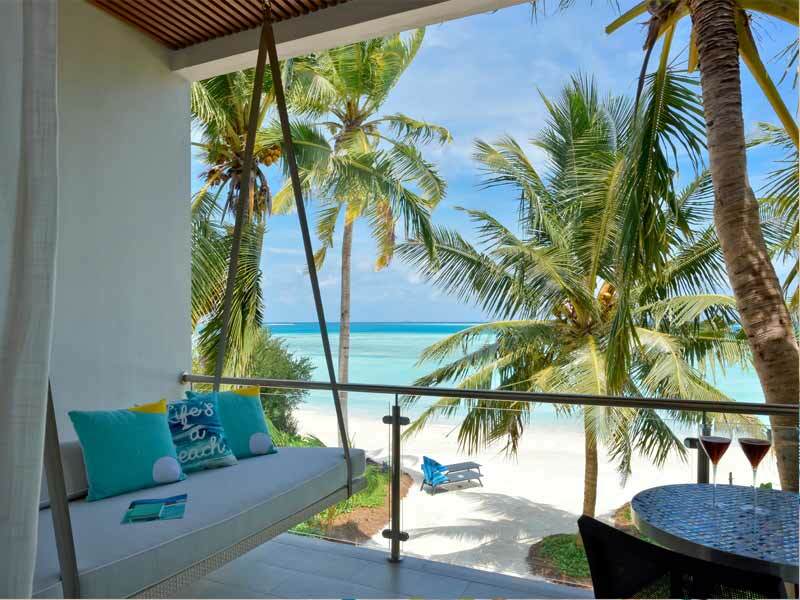 Stand before the striking Indian Ocean from your private deck in the Beach Villa with Jacuzzi. With the silky sand directly on your doorstep, this room offers a prime location for the ultimate beach getaway, At 55sq. metres indoors and another 42sq. metres externally, this grand villa comfortably accommodates groups without skipping the luxury. When you’re done lazing in your deep-soaking tub or expansive daybed, retreat to your secluded jacuzzi, enclosed by exotic greenery as you welcome the good life! 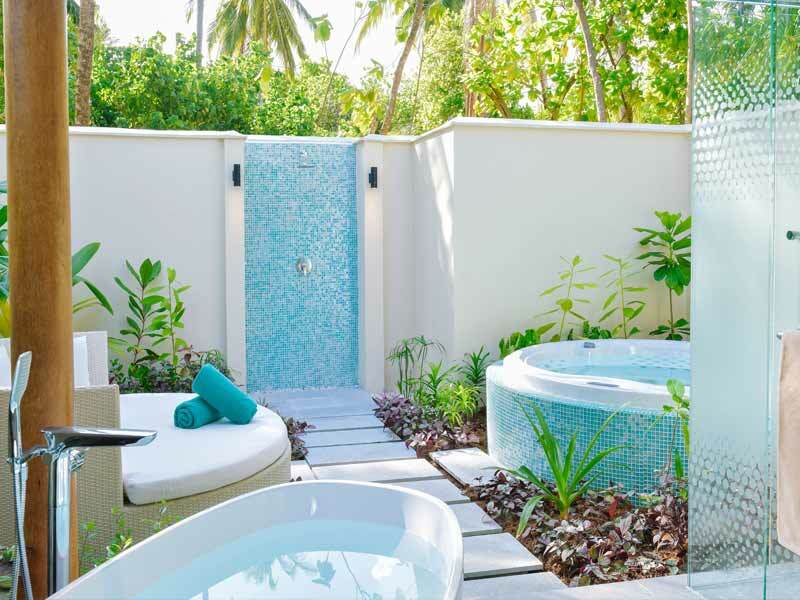 Parading a mastered mix of humble timers and striking pallets, your Beach Pool Villa with Jacuzzi is first-rate. Spread across a generous 55sq. metres inside and an additional 70sq. metres externally, this haven offers friends and family everything one could want in a tropical escape. 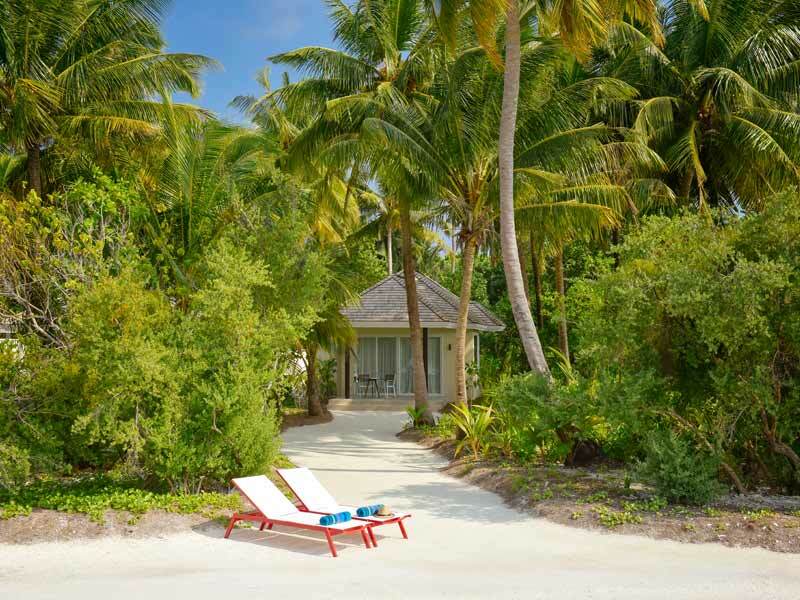 Take a break from the Maldives’ humidity as you plunge into your private pool before reclining on your plush daybed amid imposing flora. 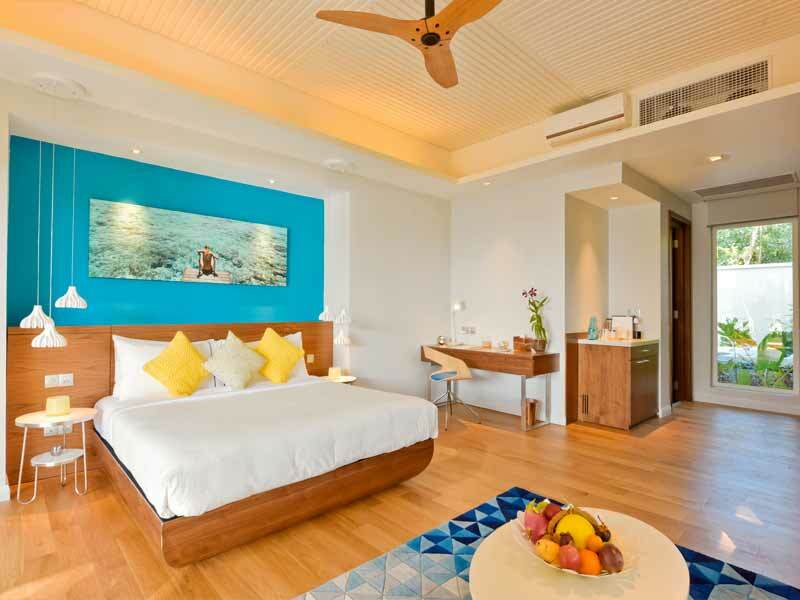 Enjoy luxurious bedding, a deep-soaking tub, secluded jacuzzi, air-conditioning, a flat-screen and more in your Beach Pool Villa with Jacuzzi set on the tranquil shoreline. 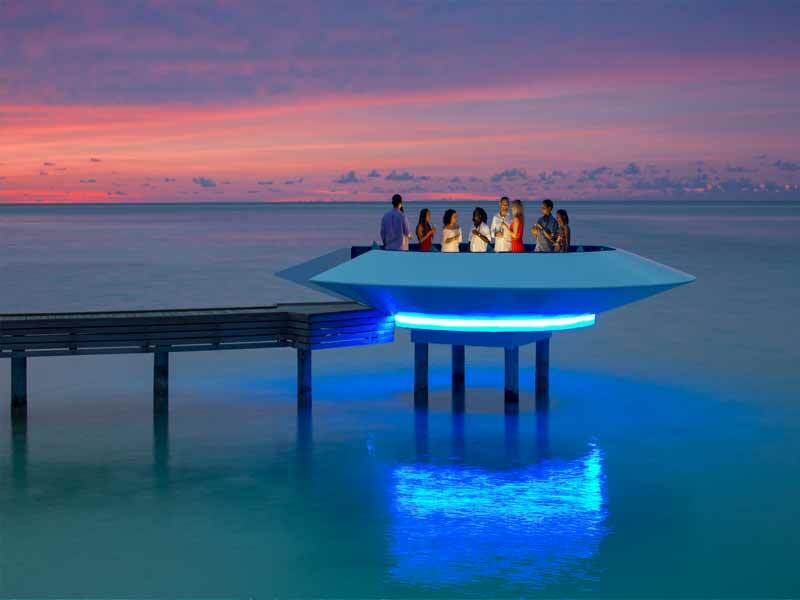 Taking luxury to the next level, your Aqua Villa has been established as an overwater retreat. With turquoise, crystal-clear ocean peacefully lapping directly below, this slice of heaven welcomes plenty of natural lighting through floor-to-ceiling windows and flaunts vistas so breathtaking, you’ll be pinching yourself. Mimicking its surroundings, the villa parades aqua-themed décor and tropical-style timber finishes. Sprawled across 48sq. metres indoors and another 25sq. metres outside, your Aqua Villa features a private deck, air-conditioning, a flat-screen TV, a lavish bathtub, plush bedding and much more. 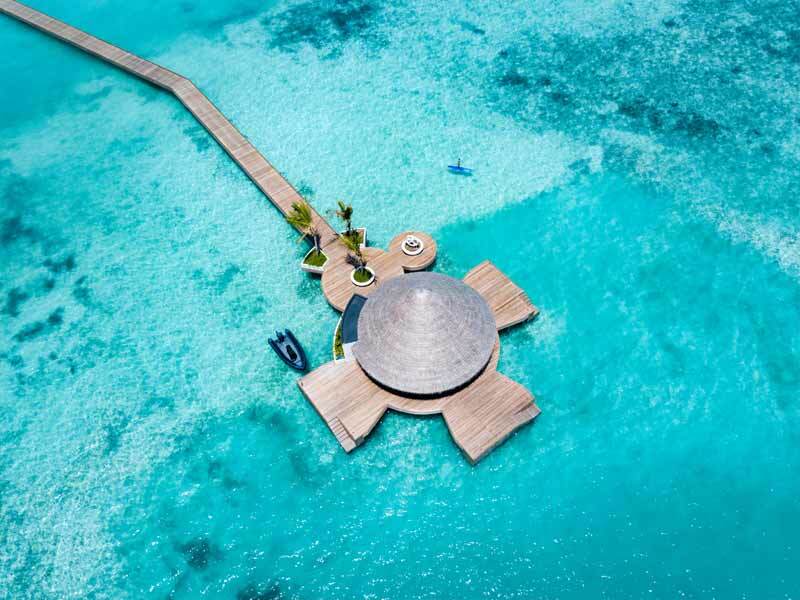 Take your pick from snorkeling along the mesmorising ocean resting directly beneath you and soaking in your private jacuzzi located on the expansive decking. Safe to assume your Aqua Villa with Jacuzzi will not disappoint no matter your preference. Stylish and totally luxurious, this villa flaunts 48sq. metres of space inside and another 25sq. metres externally. 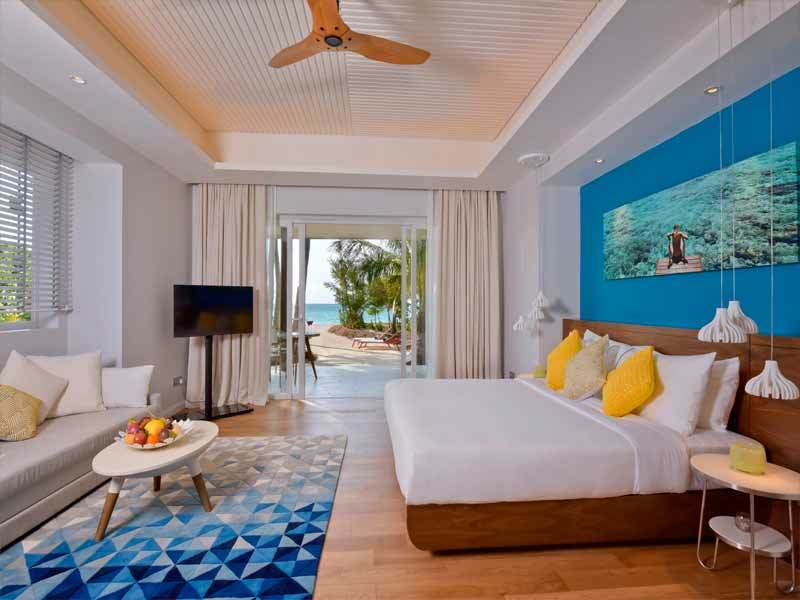 Delight in commanding ocean views, feel secluded from the world and make use of comforts including lavish bedding, air-conditioning, a grand bathtub, tropical-style décor and much more from your Aqua Villa with Jacuzzi. After arriving at Male’ International Airport, the island is accessible by a short 30-minute flight to the Dhallu Atoll domestic airport, followed by a 20-minute boat ride. The natural reef around the island creates a protected lagoon, which means the ocean water is calm and peaceful making it perfect for a relaxing stay. 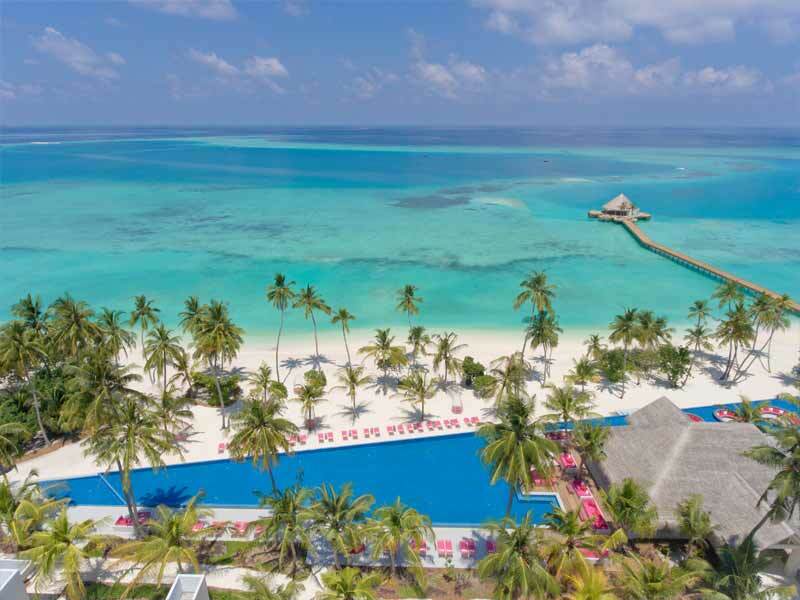 Kandima Maldives is secluded enough that you feel immersed in a pristine and tranquil marine world, but the resort offers such a great range of activities and amenities that you have everything you could possibly want during your stay. This resort is surrounded by pristine beach and beautiful ocean waters, so why not enjoy one of the many water-based activities on offer? If you want something more relaxing, start with some boating or sailing and if you’re in the mood for something more physical you can try stand-up paddle boarding, windsurfing or kiteboarding. There are some fantastic snorkeling spots and the resort has a diving school if you want to experience the incredible underwater world for the first time. 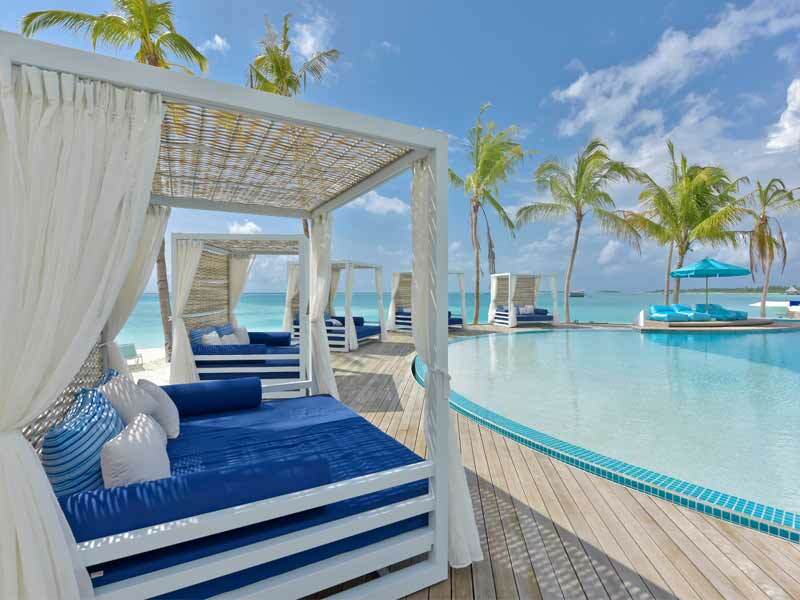 If you need a break from the ocean, the resort has 2 outdoor pools which have plenty of spots to relax in a sun lounge and enjoy the warm Maldives weather. 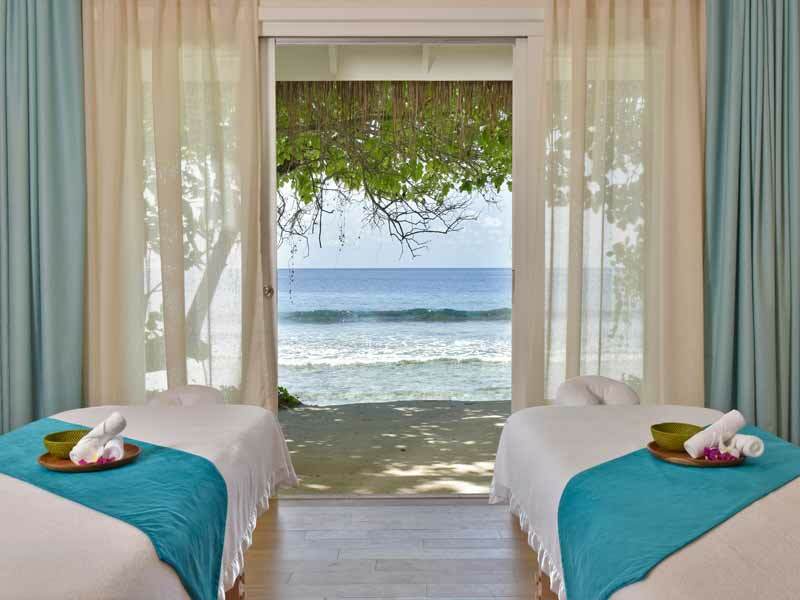 Pamper yourself in the Eskape Spa, where you can enjoy massages and body treatments with a stunning ocean backdrop. If you want to maintain your fitness regime during your stay, there are plenty of options available, with a well-equipped gym and a range of fitness, Pilates and Yoga classes also on offer. A beautiful resort in an incredible island! Definitely one of the best places I’ve ever stayed! The room was clean and comfortable and the view was breathtaking! 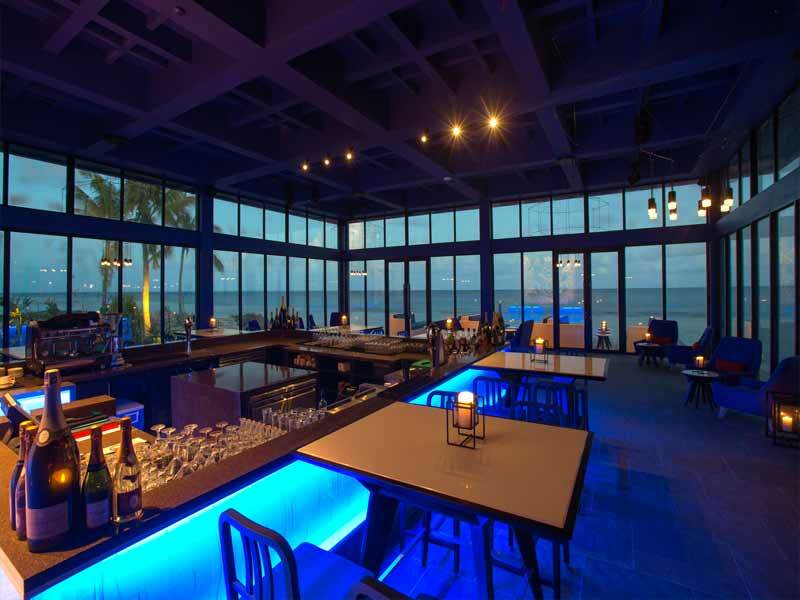 We loved the food, the beach, the relaxed atmosphere and the epic beach bar. The staff were friendly and helpful from the time we arrived and they made our experience even more wonderful with their world-class service! 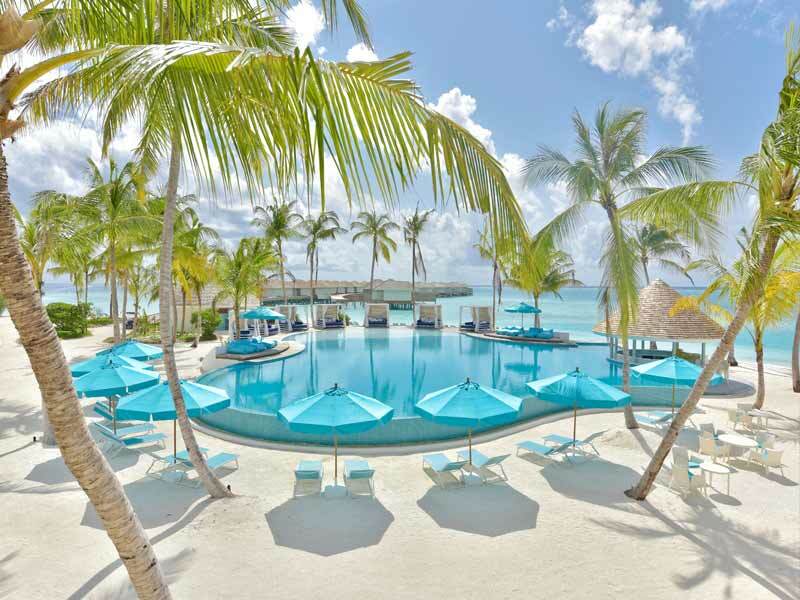 Our travel experts handpick only the finest resorts in the Maldives based on quality, service, and location. If we wouldn’t stay there, you won’t find it at My Maldives.